One of our longstanding understandings of infrastructure is that it facilitates and supports something else, but, in these discussions, we almost never discuss music (even though Jan has written extensively on the topic). When I think of music infrastructure, I typically think like a sociologist and come-up with ideas like those in this website about linking together musicians, studio owners, and show venues or infrastructure as constituting the business and legal environment music is embedded in. However, composer, pianist and software engineer Stephen Malinowski has me thinking another way about music infrastructure, in particular, about visualization infrastructure for audio stuff. Now, music visualizers are nothing new. In fact, off-the-shelf software installed on most computers is capable of it. Stephen Malinowski has created one brilliant solution to an age-old problem: how to communicate and understand what’s going on in a piece of music, particularly if you don’t know standard musical notation. The visualization infrastructure is fairly basic at this point, and, as Malinowski admits, he is only at the beginning of his ability to render music (with his imagination being one of the only limitations). 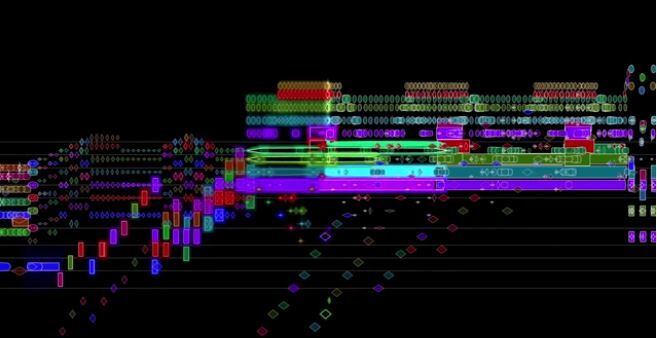 Still, his “music animation machine” is a pretty fascinating case of infrastructural development. Enjoy! I thought the point about opening up the complexity of music to people who do not read musical notation to be especially important. It allows for a whole new audience to understand music at another level, or even more precisely, to appreciate music in a different way. Sometimes I think all teaching, research, or writing is about this process of becoming someone different through multiple understandings and viewpoints. So, he may have built from notation. If you are really interested in the architecture of music you should look up the new book A Rosetta Stone by Sandborn. It blew me away. It is a paradigm change for music theory, education, composition and analysis. One will never look at music the same way again. what does the graphics add to the music there for you? It helps me understand how the parts relate.